Steam asparagus over medium heat for 5-6 minutes or until cooked and bright green. Remove from heat; set aside to cool. Arrange lettuce leaves on a large serving dish. Top with chives, bean sprouts, cherry tomatoes, grapefruit zest, avocado, red onion, sunflower seeds, asparagus, Crunchmaster® Original Multi-Seed Crackers, chicken, mango, sea salt and pepper. In a small bowl, combine peanut butter, warm water, soy sauce and grapefruit juice; mix well to combine. 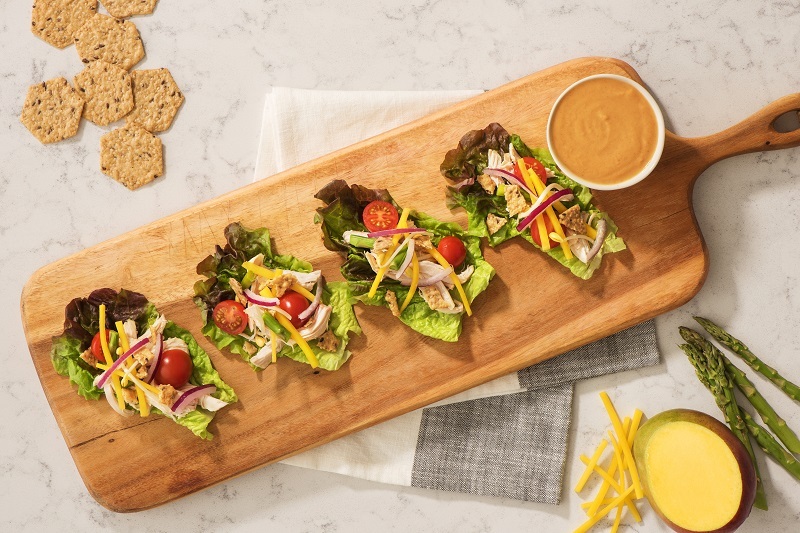 Serve lettuce wraps with peanut butter dipping sauce. © 2019 Crunchmaster and TH Foods, Inc. All rights reserved.